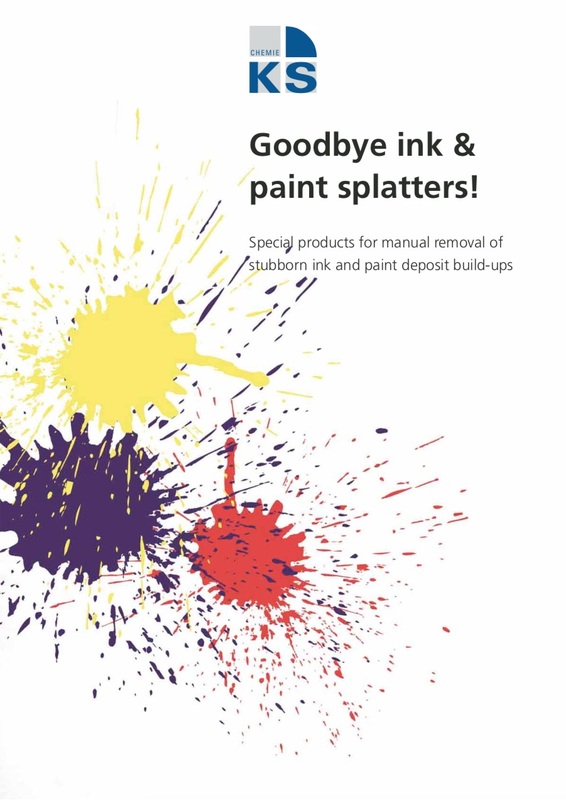 Splat­ters cannot be avoided when working with printing inks and paints. They occur some­times more and some­times less, dry quickly on the host surface or even harden, and can form thick layers. Gener­ally floors, spray booths, spray grat­ings, tools, labo­ra­tory equip­ment, or cylinder jour­nals and heads are partic­u­larly affected. Manual cleaning usually involves high time inputs. We have devel­oped effi­cient special prod­ucts in order to detach and remove such deposit build-ups quickly and easily. These high-viscosity cleaning agents on a high boiling solvent basis allow the active ingre­dient to remain longer on the surface to be cleaned and not to evap­o­rate at the rate known from solvents. The consis­tency of the special manual cleaning agents is config­ured so that they can be both sprayed and spread. They form a stable film on inclined and vertical surfaces and are thus able to act on them for a very long time and develop their full power even in the pores. Thixotropic, pasty cleaning agent on a solvent basis; removes partic­u­larly stub­born dried and cross-linked paint and ink deposit build-ups. Brush­Cleaner Forte is applied without diluting; after a short expo­sure time the deposit build-ups can be wiped away with a cloth or removed very easily with the help of a scraper. Brush­Cleaner Forte is not a hazardous substance and can also be applied in work­rooms that are only lightly venti­lated. Thixotropic cleaning agent on a solvent basis; removes deposit build-ups that have dried on and are cross-linked. Thanks to the good and easy spraya­bility, under­cuts and compli­cated geome­tries can be coated well with the cleaning agent. Spray­Cleaner Forte is sprayed on without diluting. After a short expo­sure time the deposit build-ups can be wiped away with a cloth or removed with the help of a scraper. Spray­Cleaner Forte is also ideally suit­able for detaching labels. After wetting the labels come off by them­selves. Pasty, mildly alka­line special agent for removing cross-linked printing inks, paints and varnishes. Paste A is spread undi­luted on the surfaces to be cleaned; the expo­sure time depends on the degree of wetting and the thick­ness of the layer of printing inks, paints and varnishes to be removed. Pasty, acidic special agent for removing cross-linked printing inks from stain­less steel and ceramic surfaces for the printing industry. 20 minutes at 25 °C.